The Oakland Raiders may have gone from among the worst teams in the NFL, to among the top teams in the National Football League. The world saw exactly what the Raiders might do last season, with its electrifying offense led by appealing quarterback Derek Carr, effective runningback Latavius Murray, and stud pass receiver Amari Cooper. They had a big turn-around last season, and now they’re about to get even much better. GM Reggie McKenzie made a big splash in free agency, signing offensive guard Kelechi Osemele from the Ravens, linebacker Bruce Irvin from the Seahawks, and cornerback Sean Smith from the Chiefs. Oakland’s lineup teems with stars, and it’s remarkable to see how this group has altered a lot in such little time. 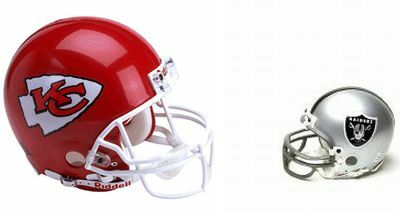 The Chiefs made an unbelievable comeback last season, beginning 1-5, and ending the reg season 11-5, then beating the Houston Texans in the Wild Card round, however to lose to New England in the Divisional Round. Still, beginning the season 1-5, then entering the playoffs, with a playoff win? An extraordinary season for Chiefs fans, no doubt. The Chiefs re-signed Tamba Hali, Travis Kelce, Charcandrick West and Spencer Ware, and franchise tagged Eric Berry. Basically, the Chiefs maintained their finest players, which needs to be thought about as an offseason success. With Jamaal Charles returning next season, the Chiefs ought to anticipate consistent success in the league.